John Moses Browning probably completed the prototype for his “New Model” pistol in 1908. This can be deduced from the fact that it was patented in Belgium on 20 February 1909, though it is often reported that the prototype was made in 1909 or even 1910. The gun was never patented or manufactured in the U.S. 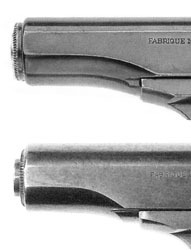 Manufacture of the New Model in 7.65mm by Fabrique Nationale (FN) of Belgium began late in 1912. Manufacture in 9mm Browning Short (.380 caliber) probably began a few months later. FN deliberately delayed release of the new design for nearly three years because sales of the Old Model were still brisk. Once released, the Browning Automatic Pistol, New Model, quickly supplanted the Old Model. However the Old Model (Model 1900) continued in production right up to the beginning of the Great War in 1914, in order to fulfill Belgian military contracts. The New Model was lighter and less complicated than its predecessor, while retaining the remarkable reliability and accuracy of the Old Model. Pollard notes that the New Model is “...smaller and handier, but has a much more appreciable recoil.” Both guns are blowback operated. The 1910 model follows the Savage Automatic Pistol in placing the recoil spring around the barrel, rather than over the barrel as in the 1900 model. The recoil spring is secured by a bushing with bayonnette-style lugs on the front of the slide. 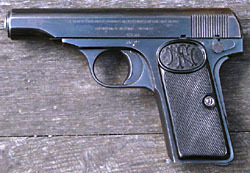 The Model 1910 also incorporates a grip safety like the 1903 Colt and 1903 FN Grand Modele. 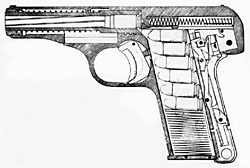 The patent drawing shown in Anthony Vanderlinden’s book FN Browning Pistols: Side-Arms that Shaped World History shows a lanyard ring in the lower rear corner of the left grip, but in actual production the lanyard was an option and was rarely seen except for police and military purchases. Unlike the Model 1900, which was only available in 7.65mm Browning (.32 ACP), the Model 1910 was offered in both 7.65mm Browning and 9mm Browning Short (.380 ACP). John Moses Browning had asked “UMC” Thomas of the Union Metallic Cartridge Company to design the .380 ACP in 1907 because Colt wanted a larger, heavier bullet for the 1903 Colt Pocket “Hammerless”. Browning specified that the case length for the new cartridge must be identical to that of the .32 ACP. The idea was that the only modification necessary for the gun to use the new cartridge would be a new barrel and magazine. The .380 barrel for what became the 1908 Colt Pocket “Hammerless” had the same external diameter as the .32 barrel for the 1903 Colt, but a slightly larger bore. When Browning set out to design the Model 1910 FN Browning, he designed it so that only the barrel need be changed to convert from one caliber to the other. The 1910 magazines for the two calibers were identical, even though they were marked 7.65mm or 9mm to match the respective barrels. The magazine holds seven rounds of 7.65mm (.32) or six rounds of 9mm Short (.380). 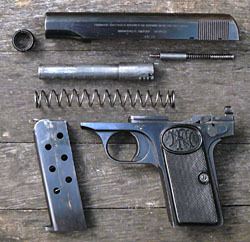 The grip safety on the Model 1910 directly blocks the sear (not the disconnector as reported by W.H.B. Smith), preventing it from moving downward and releasing the striker. The manual safety lever merely locks the grip safety in place so that it cannot be depressed, though an external lug on the manual safety lever also moves into a notch in the slide to prevent the slide from being opened. When the magazine is withdrawn a lever moves up and likewise blocks the grip safety from being depressed--hence, the arm cannot be fired unless the magazine is fully inserted. 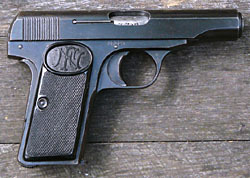 The earliest grips on the 1910 FN Browning were made of checkered horn and featured a logo similar to that of the Model 1900, with a facsimile of the gun above the FN monogram in an oval at the top. These grips were only used for a few months and are now exceedingly rare. They were succeeded by checkered horn grips with the FN monogram in an oval at the top. According to Vanderlinden, horn continued in use until the beginning of World War II, after which molded plastic was used. Horn grips are easily identified by their flat backs, whereas plastic grips have depressions in their backs from the molds. After World War II wood grips were sometimes used for the Model 1910, most with rudimentary checkering, though some luxury models featured very finely checkered wooden grips. Guns produced in the first year of production (1912-1913) have a cutout area on the lower forward portion of the slide that extends beyond the front edge of the frame. Very early on, however, this cutout area was reduced in length so that it ended just before the front edge of the frame, making a more natural-looking curve that melded with the curve of the frame and the bow of the trigger guard. Early guns with the longer cut may be considered rare. The serial number is on the right side of the frame, just above the trigger. The right side of the slide is blank. The inscription on the left side of the slide remained the same throughout production, though there were minor changes in the characters and spacing which cannot all be reproduced here. See Vanderlinden for complete details. Guns made prior to World War I feature serif characters in upper case with the exception of the “de”. After World War I the inscription changed to sans-serif characters, but retianed the lower-case “de”. There was a return to serif characters in the 1925-1929 time period, after which the legend appeared in all upper case sans-serif letters (including the “DE”). Finally, the space between “Browning’s Patent” and “Depose” was eliminated. Belgian proof marks were stamped on the left side of the frame just above the trigger, and in the same location, just above, on the slide. Proof marks were also stamped on the barrel such that they could be seen through the ejection port. There were some variations in barrel bushings over the lifespan of the gun, which are documented in Vanderlinden. The Model 1910 FN Browning was manufactured from 1912 through 1975. Production was halted during the two World Wars, though a few were assembled from parts during the German occupation in World War II. There was no interruption in serial numbers. Year-by-year production figures are not available, but it is known that approximately 69 ,000 had been made by the beginning of World War I in 1914, and approximately 467,760 had been made by the beginning of World War II. Total production is estimated to have been 704,247. Use a barrel bushing key or a spanner wrench to depress the barrel bushing and turn it 90° to unlock it. Be careful because the bushing is under spring pressure. Ease the bushing off the front of the slide and remove the recoil spring. Draw the slide back to the second detent on the left side and lock it in position with the manual safety lever. Turn the barrel counterclockwise (as you face the front of the gun) approximately 90° to unlock its lugs from engagement with the slots in the frame. Lower the safety lever and draw the slide and barrel off the frame. Automatic Pistols, by H.B. Pollard. WE, Old Greenwich, Connecticut. Reprint of 1921 edition. FN Browning Pistols, Side-Arms that Shaped World History, by Anthony Vanderlinden. Wet Dog Pub., Greensboro, NC: 2009. “UMC Thomas: A Recognition,” by Jim Foral. Gun Digest, 1998.